Famous for its big lagoon, Oludeniz acts like a magnet for mass tourism, featuring some of the most photographed beaches on the Mediterranean. 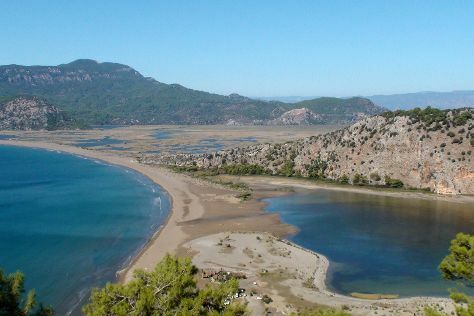 Visiting Iztuzu Beach and Kaputas Beach will get you outdoors. Relax by the water at Patara Beach and Calis Beach. You'll find plenty of places to visit near Oludeniz: Kas (Scuba & Snorkeling, Kas Daily Boat Tours with Bermuda, & more). There's much more to do: take in the awesome beauty at Babadag, stop by Can BaharatcIlIk Cihan Zor, glide through the air with a parasailing or paragliding tour, and enjoy the sand and surf at Billy's Beach. To see photos, other places to visit, ratings, and other tourist information, refer to the Oludeniz trip generator. If you are flying in from Lebanon, the closest major airport is Dalaman International Airport. Expect a daytime high around 38°C in August, and nighttime lows around 24°C.